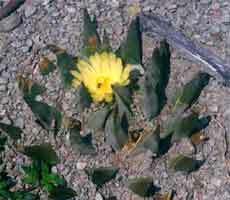 Ariocarpus trigonus elongatus LRM170, flowering at San Antonio. Limestone shale habitat of A. trigonus LRM170, at San Antonio. 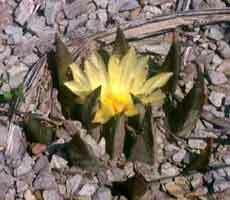 Ariocarpus trigonus elongatus LRM170, a young plant flowering in October. The plants of A. trigonus in the San Antonio area are of the 'elongatus' type, and often occur in much more open locations than the more westerly colonies. 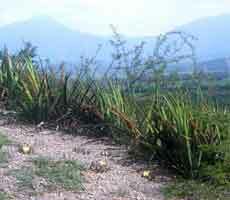 At this location the plants occurred in association with Obregonia denegrii, but generally inhabited the higher more exposed areas, Obregonia being more prevalent in the protection of the low scrub on the flats near base of the hills.